Students will connect their reading to their life experiences, other books they have read or listened to, and events or issues in the world around them. 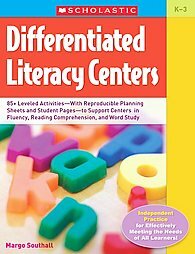 This lesson is excerpted from Differentiated Literacy Centers by Margo Southall. Text-to-Self Connections: Encourage and model for students how to make connections that resonate with their lives and draw them closer to the text. Focus on events and ideas that reoccur across the text, rather than minor details such as individual words that are useful only on that one page (Miller, 2002). Text-to-Text Connections: You may display a cumulative chart of books and other reading materials that you have read together as a class to support these connections. Introduce and make a list of the types of text-to-text connections students can make, such as comparing characters’ personalities and actions, story events, themes or messages the author is trying to convey, and different versions of the same story. Text-to-World Connections: Many of the stories we read aloud to students may reflect issues and events taking place in the world beyond the classroom. World issues and events are often reflected in nonfiction magazine articles students may read and discuss, and can also be found in literature where a character is in conflict with larger societal issues, such as the prejudice depicted in the books written on the life of Ruby Bridges. Historical fiction and nonfiction, biographies, and survival stories depicting conflict with nature often provide examples for this type of connection. Make copies of the reproducible on card stock and laminate to create task cards. If you wish to have students work on only one of the three types of connections at a time, make a task card for each section: Cut the chart apart, glue the three sections onto separate sheets of card stock, laminate the sheets, and present one at a time in consecutive center rotations. Model each type of connection before assigning it as center work. Assign, or have students choose, one type of connection from the chart (text to self, text to text, and text to world). Students choose a sentence stem listed for the connection they’ve chosen and use it to help them write a connection. Note: Not all reading material will lend itself to text-to-world connections, so be sure to offer some flexibility unless the reading material provided at the center has been specifically chosen to support this type of connection (for example, a magazine article on recycling or a nonfiction reader on an endangered animal). Model the procedure using a book for which students have copies. After the first reading, have students place a sticky note on pages you have designated as stopping points during the reading and invite them to share the connections they have made to the text up to that point. They may share these with a partner or record them on an individual whiteboard to share with the group in a “show up” format where every student holds up his or her whiteboard to the group or a partner at the same time. You may find that students in your class will have a difficult time making the connections. If this occurs, make sure to call the classes’ attention to the front of the room and provide examples that the students can relate to. Ask guiding questions; such as, “Do you remember this (give a name of a book previously read in class)? I can’t remember what that story was about, can you remind me?” Make sure the story you mention has some similarities to the one you class is working with. Scaffolding the process of critical reading is very important. I would suggest making a point of doing critical reading activities on a regular basis, before having your class work on their own. Students can also create their own illustrations to coincide with the connection they make. They could create a mini-book of their connections and illustrations. If you decide to only assign one connection for the students (i.e., self-to-text) then maybe you could have the other cards of connections available in case students finish early. This would be a great lesson to incorporate the use of a class blog or wiki. An interesting way to incorporate the use of technology in this lesson would be to reserve time in the computer lab and have the students document their thinking as a post to an online journal. The kids could spend time typing their responses and then maybe one day later, you could reserve the computer lab again, and have the students read their classmates post and they could make comments. (This would be most beneficial in an upper-elementary classroom. There is no reason why this lesson could not be modified to work with older children. The types of stories would simply have to be changed.) With young children, maybe you could read certain posts aloud and respond in a class discussion.